5303 Hampton Place - Gorgeous 3rd Floor Ocean Views from Every Room! 5303 Hampton Place Villa – GORGEOUS OCEAN VIEWS FROM EVERY ROOM OF THIS 3RD FLOOR VILLA. 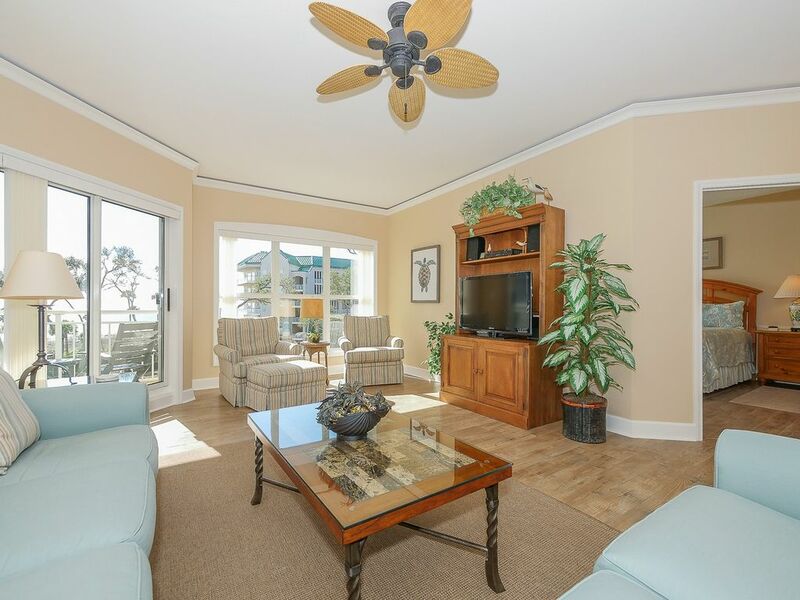 5303 Hampton Place is a charming third floor 2 bedroom, 2 bath villa located in Palmetto Dunes with direct oceanfront views from every room. The living room is quite spacious and walks out on to a large wrap around private balcony with a beautiful view of the ocean. There is a Queen sleeper sofa, a love seat and two very comfortable arm chairs that swivel with a shared ottoman. A 42” flat screen HDTV, new hardwood floors and ceiling fan add to the ambiance and make this oceanfront villa a great place to stay. The entry, kitchen and dining room have white washed Pergo floors, and there is a glass top dining table that will seat six. The newly updated kitchen has granite counters, stainless steel appliances and a breakfast bar that seats two. A laundry room is located just off the kitchen and features full sized washer and dryer. There is a great bedroom separation in this villa. The master is to the right off the living room, and features a king bed with new mattress, new hardwood floors and a private bath with a jetted tub, separate shower and double vanity. The guest bedroom is to the left off the kitchen and features two double beds and new hardwood floors. The bathroom is shared with the hall and has a jetted tub and shower combo. This bedroom shares the balcony with the living room. This well-appointed villa overlooks a gorgeous landscaped yard with tall trees. The Hampton Place complex offers an oceanfront pool with spa, grilling area, gazebo and deck, restrooms and showers. There is also an elevator and covered parking. We have been coming to HH for over twenty years. Palmetto Dunes area is our favorite. We have stayed in many units. We have never stayed in one that was not nice, but some offer more than others. This particular unit was completely updated. The kitchen was fully equipped which is important to me. That is one thing I look for when I’m booking a place. Of course, there was a view from every room, and that is equally important. Everything was super clean and neat. The proximity to everything from PD is great. We walked to The Omni for lunch. We will definitely book this unit again if available. Please call or send email inquiry for stays longer than one week. Online quotes do NOT calculate correctly for longer term rentals OR for stays that overlap two different rate periods. Monthly rates available are available 9/17/16-4/7/17, 9/9/17-3/23/18 and 9/8/18-4/5/19. Monthly rentals are four full weeks, Saturday - Saturday. Call for Specials and Hot Deals. Mention you saw it on VRBO.